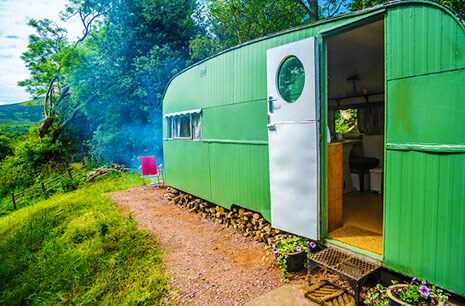 This week's Living Large In Small Spaces feature is "Gracie", a caravan located in Wales. In the summer of my twelfth year, my mother planned a one week girls' getaway -- just the two of us stayed in an old-fashioned travel trailer permanently set in a woodsy area of a nearby recreational site. The trailer was so cute. It wasn't old enough then to be "vintage", although today it certainly would be. We lounged, swam in the pool, read books, took naps, and went for rides on the paddle boat in the lake. Meals were fuss-free sandwiches and chips, fruit, chocolate chip cookies and lemonade. For a special treat we walked to the snack bar for an ice cream cone. That week in the trailer remains one of the fondest memories I have of time spent with my mom. Gracie the 1950's caravan reminds me of the trailer we stayed in. 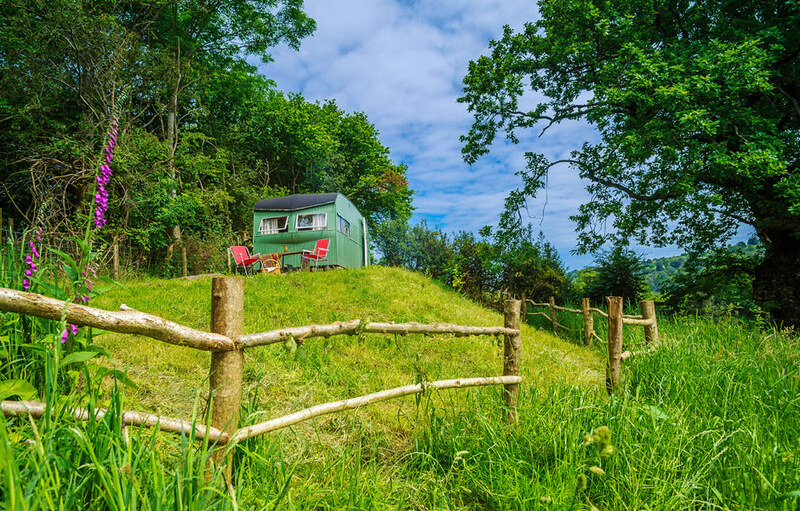 Once used as a shooting hut for the owners’ family and friends, Gracie was moved to her new spot and fully restored. The relocation involved three separate farmers, a low-loader with driver, a fork-lift operator, and a tractor and trailer man. The interior retains much of its vintage charm. Unlike the trailer my mom rented, the walk to the shower and loo is a short one; they're just outside. There's a little spot to relax outside. With a stunning view of the surrounding Black Mountains. Even without the paddle boats and the ice cream bar, I think Gracie would be a lovely place for a girls' getaway, or any kind of getaway for that matter. I'm sure Mom would agree. What a sweet little place. A nice get away from the hectic world we live in. First of all, I think your mom was extremely creative. What I notice about many moms is that they are deliberate in making memories for their children, as I can see your mother was. What a special, wonderful treat! To nurture a love for simplicity and nature, down time and bonding, what a gift that is. Many of us have to figure out that those things are very important, but not until we struggle through adulthood. But your mother gave you a great gift as a child: HERSELF. She planned it, just the two of you. Oh I could go on and on about this. Gracie (my mother's name!) is darling, and the perfect shelter for wandering in nature. LOVE! I would love a girls getaway in that sweet trailer! It is surprisingly big and cozy inside. I would stay in a dump to have that view! This is the cutest little trailer I have seen. I would have loved this as a teenager! The perfect little getaway! This is a sweet little get away and such beautiful views. Very cute. This sweet little caravan makes my heart sing! My mom and dad and I stayed in one of this vintage for two weeks one summer. I have some of the best memories of that time. And now I have a tiny vintage trailer of my own that is about to travel to the sea to meet up with a few girlfriends. I would LOVE to stay in this caravan! The view is incredible and this is a very sweet place. Gracie is "Sweet Charm" . . .
Sweet, just like the memories of your camping with your sister and mom. I love this weekly post Nancy . . . Thank you for showing us these treasures. Thanks you again for a charming visit into the world of small spaces . . . Nancy, you are a marvelous spokesperson for the tiny home movement. Aww...that is so neat! I loved reading about your special getaway with your Mom! Happy, sweet memories! I loved seeing Gracie, too. So perfect! I truly enjoyed your photos and your memories. Hope to get to know each other. It's a perfect setting for rambles around the area. That view is priceless! Sign me up :). Just lovely. I'd love to stay there. What a fun memory. I am thankful you had this special time. Thank You for sharing this getaway with us. Gracie is super sweet, Nancy, but the story you shared about the time with your mom is magical. Your tale ended too soon, I was waiting and wishing for more. Perhaps someday...in the meantime, I am glad that you were able to revisit those memories with us. Hugs to you! Oh! Gracie has an outside loo like Cottage had before! My vacation is over so now I can visit my favorite blogs. This does looks like a great place for a short vacation. It looks so nice and clean and well kept. It's wonderful place to run away for awhile from the noise of the city. A change for clean air for the lungs and away from computers and other things. I love this!! Some of my fondest memories are of childhood summers spent in a 21foot long camper parked in the woods by a creek. I spent my days in the pool or by the creek, and evenings around the campfire. We only were inside when it was raining or bedtime! Fabulous summers, and I have always wanted to restore an old vintage trailer! Wow what an amazing memory you were gifted with. I really like this post.